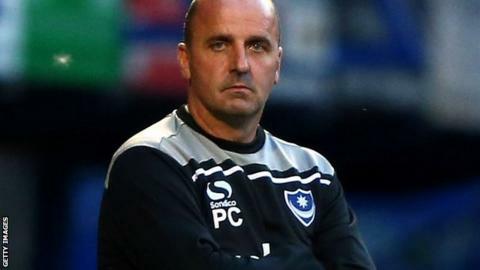 Portsmouth manager Paul Cook is refusing to get carried away with his side's rise to the top of League Two. Pompey went top of the division for the first time this season after a 2-1 win at Bristol Rovers on Saturday. Cook's side face consecutive home matches against Exeter and Yeovil as they bid to stay at the summit. "It's great to be where we are after nine games, but football has a habit of kicking you in the teeth," he told BBC Radio Solent. "Everyone outside of Portsmouth will say we should win the next two games, but by next Saturday I can guarantee we won't have two wins, because that's the nature of football." Cook, who was appointed manager in May, had Gareth Evans and Jayden Stockley to thank for giving Pompey a third away win of the season, but stressed he will stay level-headed at his side's fortunes. "We'll move on to the next game and it adds to the spice now being top and trying to stay there," he added. "It adds to the pressure of the job. If you don't enjoy being a manager then go and do something else."